Wrenches are normally used to fasten hex-head screws or to hold nuts in place when fastening a screw with another wrench or screwdriver. For the popular bit based tool please have a look at our socket wrench. Combination wrenches are open on one side and have an angled ring with a double-hex profile on the other side that can improve the grip on hex head screws and nuts. This ring also allows interlocking two of them (or one with something else, see photo) for a longer lever. "Regular" wrenches. 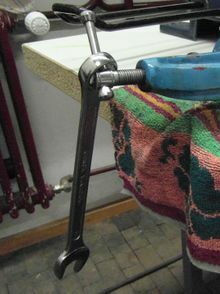 We actually don't have any of these in our workshops because combination wrenches are much easier to hang on the wall! 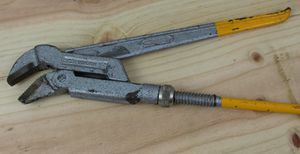 Pipe wrenches are often confused with tongue-and-groove pliers but are actually very differently constructed. This page was last edited on 6 February 2019, at 21:10.